Christmas is a baking Season. This time people bakes lots of different desserts, cookies, cakes etc. Traditional Rich Fruit Cake is a must item for baking. But beside this Traditional, we like to bake different flavored cakes, like Coffee Cake, Simple Fruit Cakes, Chocolate Cake etc. I have already soaked my Dry fruits and Nut for my Rich Christmas Fruit Cake. But all my friends who does not like the Rich Fruit Cake, Or does wants to make Fruit & Nuts cake for their Kids here is my Tutti Fruity Cake for them. 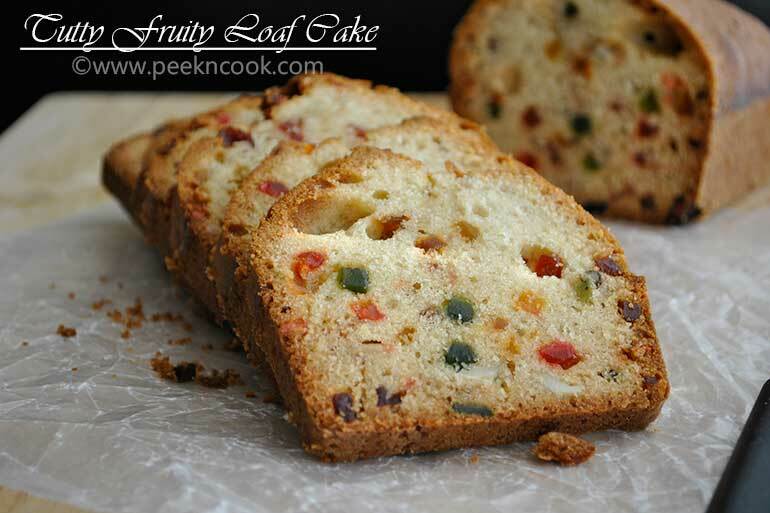 Tutti Fruity Cake is another version of Christmas Fruit Cake with lots of Tutti Fruity & Nut. Pre-heat the Oven on 350F Or 180C. Take a bowl and add the Tutti Fruity & Nuts into the bowl, add 1 tablespoon of All Purpose Flour to the Tutti Fruity & Nuts and keep aside. Now take a bowl and break the 2 Eggs with yolk, 2 egg whites inside the bowl. Add Vanilla Extract to the broken Eggs and beat with an Eletric Beater till the Eggs creates lots of foam and changed color to very light lemony. This will take at least 10 minutes. Add Sugar and Unsalted Butter to the beaten Egg and beat again with the Electric Beater for another 5 minutes and keep aside. Now in another bowl mix All Purpose Flour, Milk Powder, Baking Powder, Baking Soda and add this mixture to the Egg Mixture and mix all together with an wooden spatula to make a smooth but thick batter. Add Orange Juice & orange zests into the Batter and give the mixture a nice stir, not beat to mix well. Take the Tutti Fruity & Nuts mixture out from the bowl and mix with the Cake Batter. Add the Petha pieces too. Take a loaf pan, spray some Butter inside the pan, dust some flour inside the pan and pour the Cake Batter into the greased loaf pan. Place the Loaf pan inside the Pre-heated oven for 35-40 minutes or till the cake is done through the inside. Insert a bamboo stick at the middle of the cake, if the stick comes clear , the cake is done. If not then place the cake for another 5 minutes and remove from the oven. Let the Cake to cool down completely. Remove the Cake after cooling down, slice with a sharp knife and serve.